Most Chinese embrace a free market approach to economics. Seven-in-ten in this formerly socialist country feel people are better off in a free market economy, even though it may result in a gap between rich and poor. This faith in free markets cuts across demographic groups – women and men, more-and-less educated, rich and poor, young and old agree that the capitalist system is best. Support for environmental protection is also widespread, and the Chinese are willing to sacrifice some economic growth for the sake of protecting the natural world. Eight-in-ten in China profess an interest in protecting the environment, even if doing so has a negative impact on jobs and growth. Just as with support for free markets, this support for protecting the environment is widespread and not constrained to a particular group. Most in this rapidly changing society also say they like the pace of modern life. At the same time, however, many say that the country is losing its traditions. This sentiment is especially pronounced among the young, the well-educated, the wealthy and those residing in big cities. Despite the emphasis on individualism often associated with capitalism and modernity, most Chinese continue to believe that success in life is determined largely by outside forces. Perhaps surprisingly, wealthier Chinese – the very people who are thriving in the new China – are especially likely to hold this view. At this time of rapid growth and general satisfaction with the economy, along with the widespread concern about the gap between rich and poor noted above, seven-in-ten say people are generally better off in a free market economy, even though some may be rich and others poor. But only 16% of those surveyed completely agree. Pro-capitalism sentiments are remarkably consistent across various demographic groups including gender, age, education and income. For instance, high-income (72%), middle-income (70%), and low-income (70%) respondents have essentially identical views on this question. Views of the market do differ slightly according to where people live – residents of rural areas (79%) are especially likely to embrace free markets. On the other hand, those who live in the westernmost area covered by the survey (62%) are less likely than others to do so. While opponents and advocates of free markets resemble each other in demographic terms, they differ over concern about national issues. 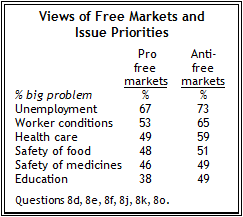 More opponents than supporters of free markets consider various economic issues a big problem. For instance, while nearly three-quarters (73%) of free market opponents consider unemployment a big problem, only two-thirds of supporters do so. Also, while nearly two-thirds (65%) of free market opponents consider worker conditions a big problem, roughly half (53%) do among supporters. The same pattern exists for health care and education. More opponents than supporters voice concerns about health care (59% vs. 49%), and education (49% vs. 38%). By contrast, both groups hold similar views on the safety of food and medicines. Free markets are important to the Chinese, but so, too, is the environment. Eight-in-ten Chinese agree that protecting the environment should be given priority, even if it leads to slower economic growth and some loss of jobs (17% disagree). For many, protecting the environment is a strongly-held view. Nearly one-third (31%) completely agree with prioritizing the environment. Just as with faith in free markets, the belief that the environment should be a priority varies little across various demographic groups including gender, age, education and income. For example, roughly equal percentages of people with a college (79%), high school (79%) or less than high school (81%) education favor protecting the environment even at the cost of economic growth. Interest in protecting the environment, however, does vary by place of residence. Those in rural areas (84%) are particularly likely to express an interest in protecting the environment (city 77%, town 79%), while those in the eastern survey area (74%) are a little less likely than those in other areas (central 84%, west 84%) to do so. Most are happy with the pace of modern life in China. 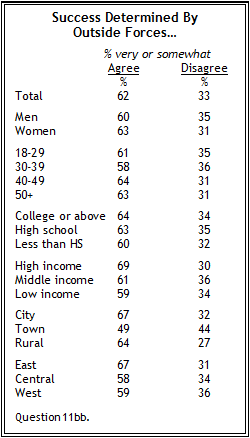 About seven-in-ten (71%) say they like the pace of modern life, while just one-quarter do not. Slightly more Chinese are happy with the pace of life today (71%) than were in 2002 (65%). Satisfaction with the pace of modern life is greater among young people – 77% of those ages 18-29 are happy with it compared with 66% of those ages 50 years or older. There are also differences among educational groups – nearly eight-in-ten (78%) Chinese with a college education or more are comfortable with the tempo of life, compared with roughly seven-in-ten of those with a high school education (68%) or less (70%). People living in rural areas (74%) are slightly more likely than city-dwellers (69%) to be comfortable with the speed of 21st century life. The pace of modernity is also especially popular in eastern China (77% vs. 67% in central and western China). Even though most Chinese approve of modern life, many also worry about fading traditions. Most Chinese (59%) think their traditional way of life is getting lost, and this view is especially common among young, well-educated, wealthy, and urban Chinese – groups that are particularly likely to be involved in the fast paced culture of modern China. 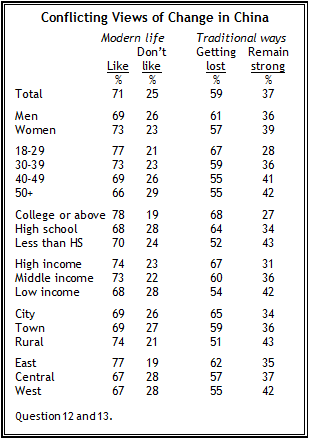 Two-thirds of those ages 18-29 are convinced that traditional ways of life are being lost, men in this age group (72%) are especially inclined to feel this sense of loss (compared with 62% of women ages 18-29). When it comes to income, the more money a family has, the more likely they believe time-honored daily practices are getting lost. Two-thirds of high-income earners sense a loss of traditions, compared with six-in-ten in the middle-income group and 54% of those with low incomes. A similar pattern exists where education is concerned. The college educated (68%) and those with high school educations (64%) are the most likely to feel that traditional approaches to life are getting lost, while people with less than a high school education (52%) are less likely to do so. Proximity to urban areas also appears to encourage a sense of loss of customary practices; more than six-in-ten (65%) people living in a major city feel a loss of time-honored customs, while just over half do (51%) among those living in rural areas. While a solid majority of Chinese are convinced that their traditional ways of doing things are getting lost, fewer feel this way now (59%) than in 2002 (68%). Those who are happy with the pace of modern life are more likely to feel that traditional ways of doing things remain strong (40%) than people who are unhappy with the pace of change in China (33%). When it comes to the issue of what determines success in life – outside forces or the individual – the Chinese people overwhelmingly believe it is determined by forces beyond an individual’s control. About six-in-ten Chinese (62%) agree, many completely (14%), with the notion that success in life is largely determined by outside forces. One-third disagree, while only 4% completely disagree. These figures have changed little since last year, when 65% agreed and 30% disagreed. In the 2007 poll, China emerged as one of the least individualistic nations on the survey on this particular measure, ranking 40th out of 47 countries in terms of levels of disagreement with the idea that success is mostly beyond an individual’s control. The U.S. and Canada tied for the top spot – in both countries, 64% disagreed. Chinese who believe individuals rather than outside forces determine success, are somewhat more likely to be relatively young. Slightly more among those ages 18-29 (35%) and 30-39 (36%) reject the power of outside forces in success than do those ages 40-49 (31%) and 50 or older (31%). Interestingly, the belief that success is primarily shaped by external forces is especially common among wealthier Chinese. Nearly seven-in-ten (69%) high-income earners attribute personal success to outside forces, while fewer middle- (61%) and low-income respondents (59%) say the same.